Lidoran Architectural Roofing, also known as Lidoran , were approached by HIE for the roof construction of the Outrigger Resort Centre. 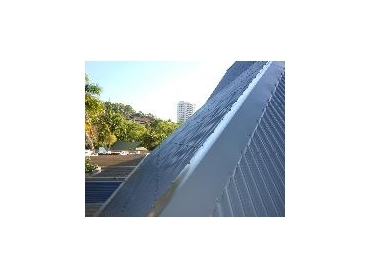 The roof construction project involved 5,100m2 of cedar shingles that needed to be removed and replaced with metal as there was a problem with serious leaks during the wet season. It took 24 men and 2 weeks of time to complete the first two towers with most of the work consisting of the labour intensive task of removing the shingles and rebattening. Two tip trucks transported the cedar shingles to the Green Waste recycling plant. The work was done using the safety harnesses and scaffolding was a must given the 45 and 60 degree pitches. The 48 Corrugated Ultra in Woodland Grey was chosen to re sheet the towers resulting in a smooth sleek look. The 15m high scaffold towers that were built inside the resort centre would enable Lidoran to change the curved skylights. The scaffolding was erected at night and dismantled at night three days later so as to minimise disruption to resort guests. This project is programmed for completion in November. Being an island meant that all materials had to be barged from Shute Harbour and all tools and equipment needed to be shipped up in containers from Sydney. Wayne Podlich, Operations Manager had embraced the logistical challenge and along with the help of his tradesman managed to secure further projects on Hamilton Island, which included an extension at the Hamilton Island airport and the installation of a roof safety system comprising of 1,500 safety anchor points to Qualia, a 6 Star resort.